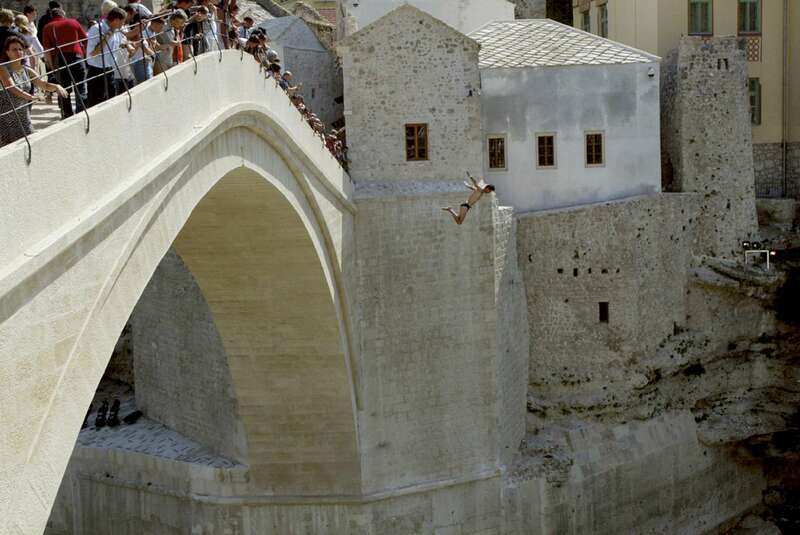 One of Mostar\'s legendary jumpers throws himself from the town\'s famed brdige, which stands more than eighty feet high. Eleven years after the bridge was destroyed during the 1992-95 war, the rebuilt structure was opened to the public after a ceremony that drew many foreign officials, including Prince Charles. Local jumpers and divers wasted no time returning to one of their favorite pasttimes before the war -- collecting change from tourists who watch them jump. Local athletes also used the week to prepare for the 448th annual jumping and diving competition, held the following week.